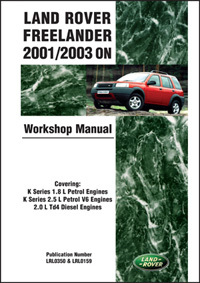 The Land Rover Freelander Official Workshop Manual: 2001-2003 features detailed engine data & work instructions for both the petrol & diesel fuel systems in the Land Rover Freelander (also known as the LR2 in North America). The book includes coverage of the K Series 1.8 L & 2.5 L petrol engines & Series 2.0 L Td4 diesel engines. Written and published by the Rover Group Ltd. for the dedicated Land Rover service technician or owner, this manual also incorporates overhaul manuals to give extra comprehensive coverage for those who need a more detailed information to enable them to carry out full maintenance, service & repair procedures.